In this edition of Piponomics, I’ve got a quick rundown of the main forex market movers this week. Did you get to catch ’em all? 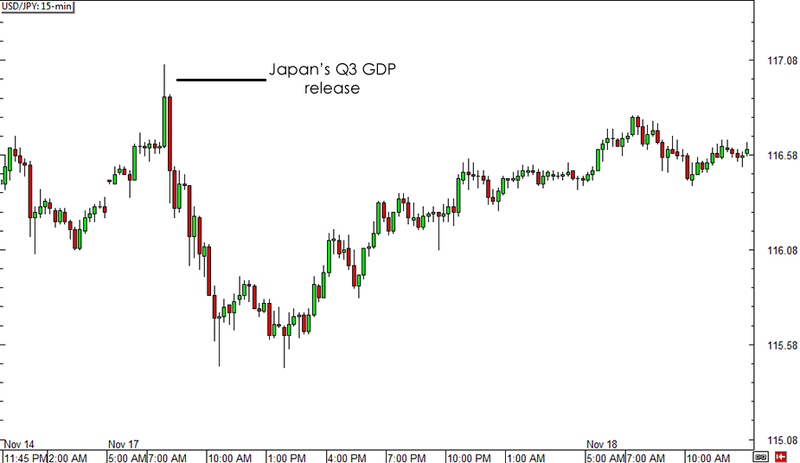 Japan’s GDP release on Monday pretty much set the tone for yen price movement for the rest of the week since the report revealed that the country slumped back in recession. The initial reaction to the release wasn’t as straightforward though, as the Japanese currency actually rallied when market participants predicted that Prime Minister Abe would have to delay the next sales tax hike. USD/JPY and the rest of the yen pairs quickly recovered upon finding support at areas of interest at the end of the Asian trading session, eventually erasing most of the day’s losses in the next sessions. It looks like commodity prices ain’t done tumbling! 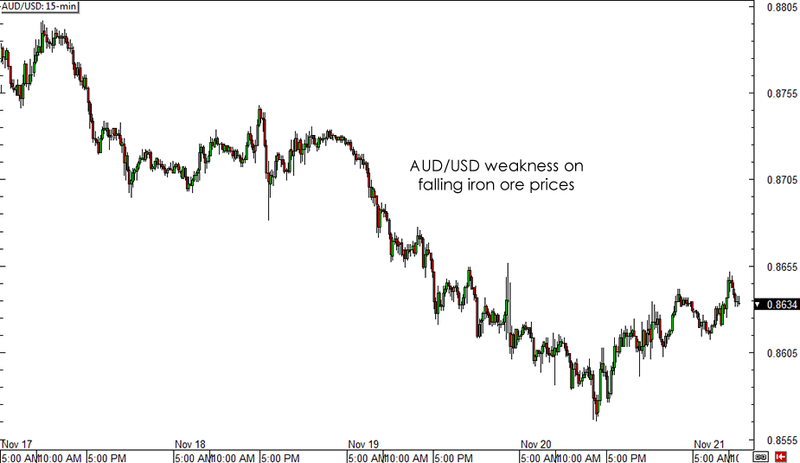 News that iron ore prices reached new record lows took its toll on the Australian dollar, triggering a 200-pip drop for AUD/USD mid-week. Bear in mind that this commodity is one of the Land Down Under’s top exports, as its economy is heavily dependent on the mining industry. The New Zealand dollar also had its share of losses later on, as the dairy auction revealed another slump in prices. The Global Dairy Trade price index chalked up a 3.1% decline, leading analysts to speculate that another milk payout cut will be announced by Fonterra, the country’s largest company and the world’s biggest dairy exporter. As though the yen’s post-GDP release losses weren’t bad enough, the currency got hit by another wave of selling when the BOJ drew more support for its monetary easing plans. Even though Governor Kuroda tried his best to sound hopeful about economic prospects, most forex traders didn’t seem to buy it this time since the numbers are looking grim. BOJ officials also seemed to be urging the government to push through with the next sales tax hike next year, as the country needs to trim its public deficit. This suggests that the central bank could be open to the idea of more aggressive policy easing should another consumption tax hike wind up hurting growth again. 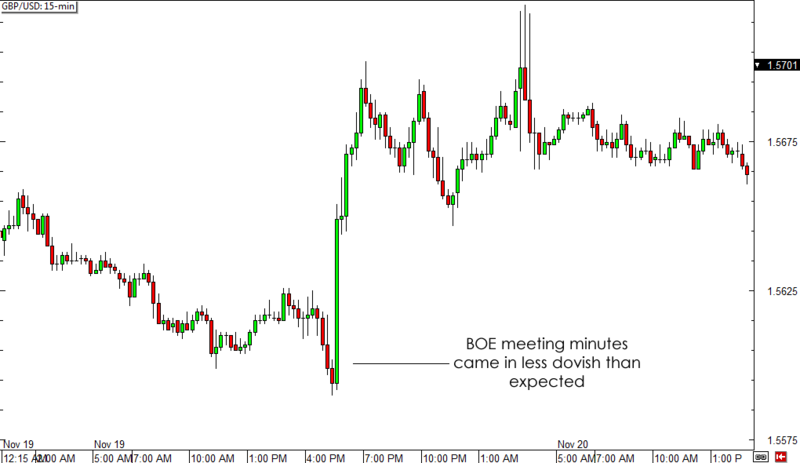 In a surprising turn of events, the BOE meeting minutes led to a strong pound rally as policymakers didn’t seem as dovish as many expected. In fact, the two hawkish members who have been insisting on a rate hike for the past few months still voted to tighten policy even as data from the U.K. has failed to impress. Although the FOMC mostly stuck to the script and refrained from shocking the markets, the minutes of their latest meeting revealed that they are still on track to hike rates sooner or later, which was enough to keep the dollar supported. While the dollar’s reaction to the report was limited, the Fed’s policy bias could be indicative of longer-term forex market trends for the major pairs. Some of these currency moves might not seem much since they’re not multi-hundred pip reactions after all, but remember that a good trading strategy and proper risk management techniques could still convert these to significant account gains. It’s also worth noting that market expectations play a role in determining how price would react, as surprises often lead to sharp moves with sufficient follow through for the rest of the week. Were you able to catch any of these big movers? Let us know how you were able to grab or lose pips off these market events and what you’ve learned from your trades!